This mixer comes with a Powerful Motor Of 750 Watts. The Body Of the mixer grinder is made of ABS Plastic. 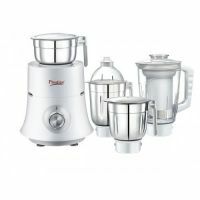 It comes with 5 Different Stainless Steel Jars. Out of these, are 3 Stackable Jars with inter-changable Lids. The Pop stop lid locker makes the jars spill-proof. Inclined Water Draining Outlet is one of the main features of this mixer. Unique Six Way Coupler Design. The jars have Die-cast Aluminium Handles. 5 Stainless steel multi-purpose blades help in grinding, mixing, blending, chutney grinding etc. To Recieve updates and possible rewards for Prestige Teon Star please sign in. To Recieve updates and possible rewards for Juicer Mixer Grinder (JMG) please sign in.